Discover the secret of a perfect seam finish! 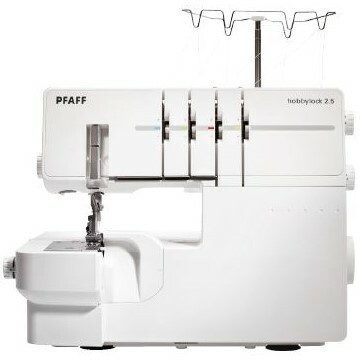 The exceptionally sturdy and reliable PFAFF® hobbylock™ 2.5 overlock machine features an automatic thread tension system that makes seam finishing perfect. Always the right stitch. Give your ideas the perfect ending! 4,3, 2 Thread Sewing – many options for utility and decorative sewing. Sturdy Machine with a Large Sewing Space – A large sewing area ensures easy maneuvering of your project. Auto Tension Dial – You select the stitch and the PFAFF® hobbylock™ 2.5 will set the thread tension automatically! Tension Release – Threads pull easily with the presser foot is up. Easy Threading Instructions – just following the color coded markings! DVD with step by step instructions is included in the box. PFAFF® Design – built to make sewing easy and to achieve the professional result that every sewer is looking for. 15 Stitches – trim, stitch, overcast and decorate projects quickly and easily. Rolled Edge – Built-in! Sew 2 or 3 thread rolled hems quickly and easily!! No need to change the foot or the stitch plate. Differential Feed – Adjustable for perfectly stitched seams. No puckers of fine, delicate fabrics. No stretching of knits. Create wavy lettuce edge easily. Lay-In Tension and Color Coded Thread Paths – for quick and convenient threading. Adjustable Stitch Length, Cutting Width and Presser Foot Pressure – choose optimal setting for different fabrics and techniques. Extra Presser Foot Height – room for several layers or heavy fabrics. Electronic Piercing Power – stitch by stitch with full piercing power at all speeds. Upper Cutter – mounted from below that makes it convenient when threading. No need to disengage. Two Thread Converter – Built in for easy conversion to 2 thread stitching. Thread Cutter – conveniently placed for quick cutting of threads. Extended Carrying Handle – Built-in! Move your PFAFF® hobbylock™ 2.5 without tangling the threads. Presser Feet – snap on feet makes it easy to change to an optional foot for specialty techniques. Safety Lock Out – when the front cover is open the machine will not sew. Universal Standard Presser Foot – that can be used with all the built-in stitches. Waste Tray to catch the fabric trimmings. Click here to download a pdf file of the stitches. A wide range of optional accessories to enhance your sewing projects.